Songwriting duos, especially in the sixties, were very common and very successful, Lennon & McCartney, Goffin and King, Bacharach and David etc, but songwriting trios are a rarer breed, the Bee Gees would be an obvious thought and in the eighties and nineties Stock, Aitken and Waterman but this week I look at Holland-Dozier-Holland, but more as an artist than as songwriters. In 1967 there was a major dispute between the trio and Gordy over royalties and money generally and so the following year they quit the label and formed their own labels Invictus and Hot Wax, the former being more successful in the UK and the latter in the US. Motown sued the trio for breach of contract over their names being on the label and the trio counter-sued. They began using pseudonyms and it took 10 years until the case was finally settled. The trio’s biggest success was in 1970 when Freda Payne took their song Band of Gold to number one. The other charting act on their label was Chairmen of the Board who notched up 10 hit singles. 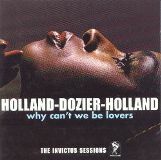 In 1972 they released the single Why Can’t We Be Lovers which was actually bizarrely credited as Holland-Dozier featuring Lamont Dozier. It failed to make the Billboard Hot 100 but did reach a respectable number nine on the R&B chart, in the UK it got to number 29. It’s the ultimate song of a broken down relationship although no obvious reasons are given, but, as is so often the case, the man can’t accept the fact that his woman has moved on. Lyrics like ‘Girl, you’re the habit I can’t break, I’d fall apart if you weren’t there when I awake’ are very moving, but it doesn’t change her mind. Dozier parted company with the Holland brothers in the mid-seventies, and moved to California where he embarked on a solo career, in America he made the top 20 with Trying to Hold to My Woman and also recorded the original version of Going Back To My Roots which was a major hit for Odyssey in 1981. He also wrote or co-wrote Sixteen (Musical Youth), Invisible (Alison Moyet), Infidelity (Simply Red), Sold (Boy George) but his biggest success came in 1988 when he teamed up with Phil Collins where the pair wrote Two Hearts and Loco In Acapulco which were both featured in the film Buster. It additionally earned the duo a Grammy, a Brit award, a Golden Globe, an Oscar nomination and an Ivor Novello Award. In 1990, as Holland-Dozier-Holland they were inducted into the Rock and Roll Hall of Fame. In 2009 the trio reunited for a one-off occasion to compose music for the scores of the musical production of The First Wives Club. It contained over 20 new songs and was turned into a TV film in 2016. Lamont Dozier has also taught a course of popular music at the University of Southern California. It’s not often songwriters get mentioned in lyrics of songs but in 1986 Billy Bragg recorded the song Levi Stubbs’ Tears, Stubbs, for those who don’t know, was the lead singer of the Four Tops and Holland, Dozier and Holland, along with two other Motown staff, Norman Whitfield and Barrett Strong, all get a mention.